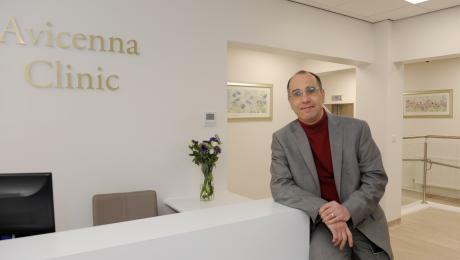 Local businessman Bruce Dodworth tells his story of pain and how a ground-breaking procedure at Peterborough’s Avicenna Clinic saved him from surgery. He was ready for the big five-oh. Holidays booked. Plans made. Celebrations a-go. As an active person, regular tennis and squash player, Bruce even climbed Ben Nevis the month before his world turned upside down. But as many who have experienced a similar situation will tell you, it wasn’t a winning volley or slip down Ben Nevis that saw this active businessman rendered immobile. Having experienced a similar sensation 9 years earlier, he’d sworn to himself that, should he find himself in the situation again, he would call an ambulance. Rather, what followed for Bruce was weeks of complete agony. Unable to stand up straight or bear any weight on his left leg at all, he was on a cocktail of very strong prescription painkillers. Whilst talking to Simon, an old friend of his about his predicament, he was offered alifeline. “I had been wandering around the house in complete agony. In fact – agony doesn’t even explain it. I didn’t know what to do with myself; it was all consuming. “So, when Simon said slightly glibly – ‘We all have our experts Bruce, but my go-to guy is an Osteopath called Jo Sunner.’ I welcomed the referral. I had been to physiotherapists for many years, but Osteopathy was new to me”. Unfortunately for Bruce, the Osteopath was not to be the magic answer in this particular case. At his appointment, Jo Sunner explained that his case was a medical emergency and he needed a referral for an MRI Scan as soon as possible. And that was when Bruce and Dr Hany Elmadbouh met for the first time. “I recall receiving a call from my colleague, Mr Sunner, explaining that a patient he was seeing needed an emergency appointment and MRI Scan.” Explains Dr Hany Elmadbouh, Lead consultant and radiologist at Avicenna Clinic. “Apart from the significant pain Mr Dodworth was in, he is also an incredibly busy man. He needed an appointment as soon as possible. Fortunately, I was able to arrange to see him the following day at the clinic”. Avicenna Clinic, based in central Peterborough is a private healthcare facility that is known for its leading consultants, state-of-the-art facilities and speedy access to appointments – which was fortunate for Bruce, who didn’t have the luxury of time due to his impending work commitments. “When I walked through the doors of the clinic, I didn’t really know what to expect, but I was immediately impressed. ‘I completed my registration details before being escorted through to the MRI Suite. Reviewing the images a short while later, Dr Hany was able to offer his diagnosis. “What I could see was a foraminal disc herniation, in contact with emerging L4 nerve root at the L4/5 level. Basically – in non-technical terms – a bulged disk that was exerting pressure on Mr Dodworth’s nerve and causing his immense pain. What Mr Dodworth had not been aware of when he booked his appointment with the clinic is that the MRI Scanner that had just done his initial diagnostic scan was the only Open MRI Scanners in the East of England. This meant that, rather than administer the injection with a certain amount of guess work, using cutting edge technology and a technique not yet used in the UK, Dr Hany could use the Open MRI Scanner to help him guide the nerve root injection right to the area which was most inflamed and causing Bruce the most pain. “Again, the logistics of finding a position that would allow me to receive the injection was difficult; the pain from the injury stopped me from being able to lie flat. However, Dr Hany persisted and, over the course of half an hour to forty minutes, he gradually inserted the a special MRI compatible needle close to the inflamed nerve, using the scanner to guide the way, before carrying out the injection. “It was an odd feeling. I felt a cold sensation run down through my left leg and into my feet, before feeling a warm sensation coming back up the other way. And then I felt it. Relief. Complete pain relief. I stood up off the bed of the scanner and straightened my back for the first time in 3 weeks. I could have hugged him”. And that was the ground breaking and special moment that Dr Hany and Bruce had shared. The first MRI-Guided spinal injection in the UK; a 100% success. A proud consultant and a pain free patient. “It’s a slightly nerve racking moment of course.” says Dr Hany, “I’ve been a consultant radiologist for 20 years. I have performed tens of thousands of spinal injections using different technology, but MRI guidance is more accurate, offers diagnosis and treatment in one step and does not have the risk of ioninzing radiation of the X-ray method. I believe in MRI guidance as the future for image guided intervention – I invested in the equipment after all. “But to see a man, who was literally broken by pain, stand up straight, pain free, after being hunched over in agony less than an hour earlier, was something to behold”. And the happily ever after continues. After seeing some pain return a few days after the procedure, Bruce has now seen a continual improvement in the weeks that followed. In fact, the results have been so astounding that Mr Wojcik, the spinal surgeon Dr Hany referred him to, has since confirmed that there is no need to consider surgery at this stage. With some regular physiotherapy to aid his full recovery, he longer needs the surgery that would have put him in pain and recovery for many months to come. For Dr Hany, this is the sort of happy story he imagined when he made the decision to open a private healthcare clinic back in 2014. It’s been a long journey since then and, having gone through years of planning, renovations and re-fitting the entire building, this case has given him a glimpse into the future of his patient care in the years to come.